In today's cinema, 3D and IMAX are dominating the multiplexes in an effort to drive audiences to the movie theaters to give people an event that they cannot yet experience at home. Although 3D televisions are growing in numbers and the technology is improving, motion picture distributors still have the upper hand when it comes to offering the best multi-dimensional sights for viewers. 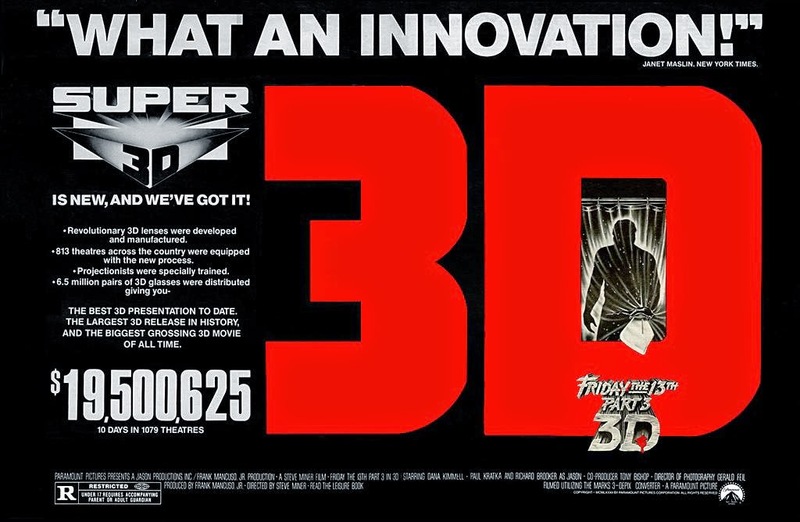 The 3D experience is not something new that has been started only within the last few years, it has been as popular in the 1950's as it is today. There was a mini resurgence in the early 1980's and the Friday The 13th film franchise helped spearhead that brief renaissance of three dimensional viewing for which Friday The 13th Part 3 earned a substantial profit for Paramount Pictures. As such a profit was made, Paramount decided to celebrate its success with Part 3 and the newer 3D technology utilized to bring a more advanced 3D film to theaters. To boast about the success, Paramount placed an ad in the Daily Variety. Below is the original ad, dated Tuesday, August 24, 1982. The ad actually is quite detailed in what was done to bring Jason Voorhees into the audience. Check out the original insert below and wonder what Jason would look like in today's 3D world? !